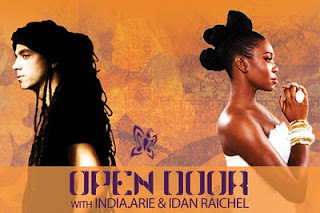 Since I first heard of the upcoming tour by Israeli musician Idan Raichel and American singer India.Arie, I puzzled over just what kind of music to expect. Raichel, after all, has a couple albums of folk-pop Hebrew music, and on his last album Within My Walls he collaborated with singers including Colombian Marta Gomez, Cape Verdean Mayra Andrade, Somi from Rwanda/Uganda. Arie first met Raichel when she was vacationing in Israel." I was asking people, 'Who’s the most important, young, political, revolutionary singer-songwriter?'" Arie relates. "And everybody said,' Idan Raichel.'" While Raichel has a foot firmly in the pop side of music, it's usually pop "world music." So how would this partnership with an American singer work, and what would it sound like? "I sent India.Arie many melodies from Israel and a few songs I wrote," Raichel explains in an interview. "In Atlanta, she wrote a few of the songs, and we decided to make an album called Open Door, which is a beautiful artistic collaboration." The two performed as part of the 2010 Nobel Peace Prize ceremony (video). And they've done a few shows in the USA and Europe, giving us these samples. Intrigued? Their remaining USA tour schedule is below, and their album is slated for a release sometime in the fall.